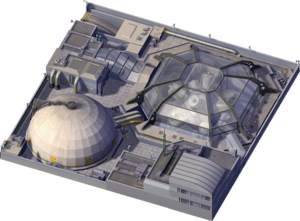 The Hydrogen Power Plant is a utility building that produces Power for your Sims. The Hydrogen Power Plant is the most expensive power solution in SimCity 4 initially, but its low cost per MWh/month makes it only slightly dearer than Oil in the long run, however its lofty unlock requirements and high outright monthly cost place it out of reach for all but the largest of cities and conurbations. The Hydrogen Power Plant is best used to supply not one city, but a group of cities, single-handedly able to power the needs of over one million sims in the right conditions. It is positioned above the Nuclear Power Plant in individual power production with no other plant surpassing it. Its compact size, incredible output and reasonable long-term cost make it a no-brainer for any city or group of cities that has it available, can afford it and can use it to its fullest extent. The Hydrogen Power Plant appears in the Reveal trailer for SimCity (2013). This page was last modified on 27 December 2017, at 06:05.